I have awesome news and awful news today, which I think illustrates the best and worst of humans. 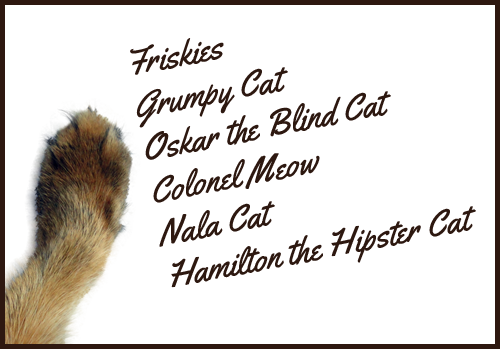 Don’t worry, no kitties got hurt in the awful news… ugliness in the heart doesn’t always express itself violently, but that does not mean it is any less hurtful — because its expression can lead to harmful acts. But first the good news. I have to give a big paws up to the Friskies team, and celebrity cats Grumpy Cat, Oskar the Blind Cat, Colonel Meow, Nala Cat and Hamilton the Hipster Cat. 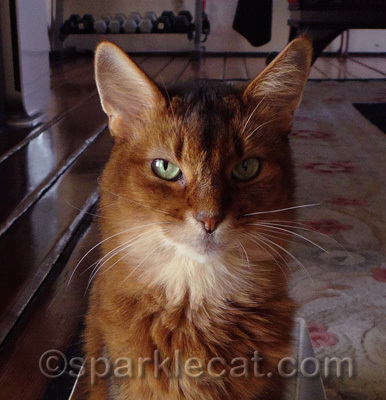 Just yesterday, I shared a blog post about the music video these kitties made with Friskies. Every time the video was viewed, Friskies promised to donate a can of cat food to the rescues each celebrity cat supported, up to 500,000 cans. Well, the video debuted on Tuesday, December 10, and it only took two days for it to reach its goal! That means Humane Society Silicon Valley, Kitten Rescue, Seattle Persian and Himalayan Rescue, Purrfect Pals and the Cat Welfare Association are each getting 100,000 cans of cat food! That is going to feed a lot of kitties in need! Great job, everybody! Now I want to mention something a lot less pleasant. In the middle of this worthy event, TMZ came out with a small-minded and cruel video making fun of Grumpy Cat, calling her retarded and stupid and making fun of her. Grumpy Cat has feline dwarfism and a placid demeanor, neither of which necessarily indicates a lack of intelligence… but even if she weren’t very bright, it’s still horribly wrong to poke fun at a creature (or a kid) that is different. It gives validation to the worst impulses in human beings and encourages people to do awful things to animals and other humans who are different from the norm. Sorry I’m not linking to the video, but if you want to watch it (and get as mad as me and my human), you can go to the TMZ website and do a search on Grumpy Cat. TMZ gets an emphatic paws down for this tasteless and ill-timed video. They have never been a paragon of good taste, but this is even lower than the regular fare on their website. Now that I’ve had my say, let’s forget about TMZ and remember all the good humans and animals can do when they work together. TMZ is mean to everyone and that is why I don’t like them. They are basically schoolyard bullies–making fun of everyone around them. The less attention we give them, they will not have jobs anymore. Let’s all just ignore them. I have never heard of TMZ and am now glad that I haven’t. Making fun of anyone, animal or person is wrong. Hurray fer the cans of foods fer the other kitties! 2 pawz up fer all da cat food donated!!! 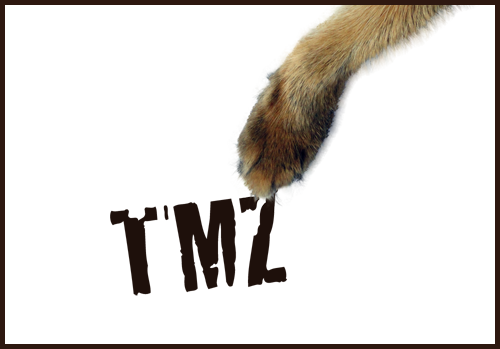 2 pawz down fer TMZ…me n Mum not gonna waste anytime lookin at da video cause we wuud rtather look at yer bloggie n see da guud in da werld…we saw Grumpy Kat on Anderson Cooper n she iz a sweetie pie…. 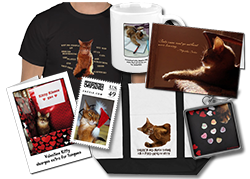 Yer rite Sparkle dere iz guud n bad in Hu’manz….phankfully we haz GUUD onez WHO Lub us just as we are….purrfect!! I shared that Friskies video. Very cool! TMZ is retarded. Pfftt! How awful of TMZ. That is just cruel to pick on a poor kitty. Congrats to Friskies and everyone that helped to make it a success. Good job, internet cats and Friskies. As for TMZ… big hiss to that behavior. Although the head peep may be the only cat person in the blogosphere who isn’t on the Grumpy Cat love train, there’s no reason to talk about anyone — human or otherwise — the way that those TMZ adolescents did about Grumpy Cat. We have never watched TMZ, thank heavens. They sound like terrible people or what ever they are. That is so sad. We think Grumpy Cat is so cute. All cats are cute in one way or another. People just get jealous. Take care. Thanks for tweeting about Baby Doll and Girl Kitty. Grumpy Cat rules!!! !… TMZ drools!!!!!! Too bad TMZ had their head up their you-know-what. Very offensive to cats, humans, really anyone with a heart and a brain. I saw the Friskies video, and Oskar’s posts about the trip to/from making it. 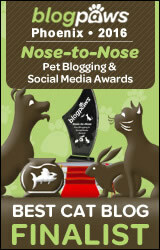 It was wonderful to see all five cats in the video and pawsome that they reached the goal so quickly. As for TMZ, fat tails and hisses to them for being so cruel. I have seen some posts about it saying “its just a cat”, “its just a joke”. I say, replace the word cat in the title with kid. Just a bunch of underachievers making fun (and being mean) about some beings differences. And paws up to you Sparkle for calling them on it. Well, the event was terrific even if the Idiot Alarm did go off! Congrats on the good news Sparkle. Mom has come to the conclusion that there are folks who never ever learned to live by the Golden Rule of treating others as they would like to be treated. Hugs to you and Grumpy cat…. As a special needs cat, I can say that making fun of anyone in a mean spirit is not appreciated. I can make fun of my own stump, and I do, but calling a poor kitty retarded is just not cool. – Crepes. I don’t know what TMZ stands for but I detest it now after reading this. That is amazing about the food donations. We watched the video. As to the other – I blow goat gas in their faces. Bullying, no matter what the form, is just not acceptable. I’m reallly surpriuzed at TMZ. I think Carmine, Milita, and Jewel said it best (and you, too!). We will not be wasting our short time on earth watching dog yak like that. But outstanding news about the food! Great job, Sparkle, for pointing us to the video! YAY de videe oh wented sew well in onlee two dayz !!! total lee awesum that all de shelters will get de goodz…. N de food serviss gurl willna watch, click on, ore visit TMZ…..
it must be run by 4 & 5 yeer oldz coz her haz knot hurd langauge such az stupid, ore retarded with reference ta poking fun at, sinz her wuz ona playground in kindergarten…. enjoy yur week oh end guys ! LOVED the Friskies video and seeing all the cats. mom was jealous of your assistant. and how awesome to reach their goal in 2 days!!! as for TMZ and small minded people….we say – pfft! Massive paws up to Friskies for the incredibly fun music video they put together and reaching their goal so quickly…that’s the power of cat people!!! The TMZ clip is disgusting…Grumpy Cat is a perfect little angel loved by millions and their measly little website is just jealous! We watched the video…it was great! We knew it wouldn’t take long to reach that goal! YAY! And pffffttttt to TMZ! Aren’t there better stories for them than making fun of cats? Sheesh. We loved the OTHER video, with all five. It was sweet and we are so glad the goal was already reached. Yaaay for that! As for tmz, well…. we have no wish to see that. We think Grumpy Cat is just about purrfect. Concats on the food donation! There is no good reason fur being so mean!!! We refuse to watch the video! We hope that Grumpy Cat’s human did not let hers see the video.